Data Provided By GSBOR on 2/17/09. Information deemed reliable but not guaranteed. Prepared by John Knowles, REALTOR. About The Authors: Betty Knowles is a full-time REALTOR® with Coldwell Banker Vanguard REALTORS® in Springfield, MO and proudly serves on the board of the Greater Springfield Board of REALTORS®. She also served as President of Women’s Council Of REALTORS® in Southwest Missouri. Betty’s genuine passion is helping people buy and sell homes in Springfield, Ozark, Nixa, and surrounding communities. John Knowles is likewise a full-time REALTOR® with Coldwell Banker Vanguard and a member of the Greater Springfield Board of REALTORS®. A self-proclaimed computer geek, John is talented at developing real estate websites, videos, photography, blogs, search engine optimization and other technical skills essential to marketing and selling real estate in Springfield MO. 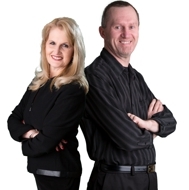 Together this dynamic team makes up TeamKnowles REALTORS®, Spouses Selling Houses! They are dedicated to doing what it takes to sell your home in the greater Springfield real estate market, or help you purchase a home that fits your particular needs. Give TeamKnowles a call today; you’ll be glad you did! Post © 2019 Betty Knowles, TeamKnowles REALTORS® - Springfield MO Real Estate (Coldwell Banker Vanguard - www.teamknowles.com). Design © 2019 ActiveRain, Inc. All rights reserved, Inc.